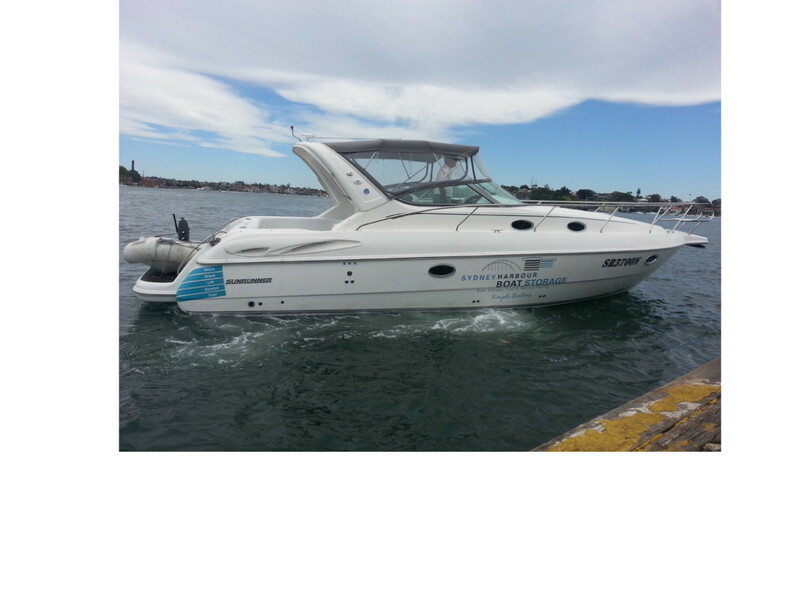 Brett McMullen co-founder and General Manager of Sydney Harbour Boat Storage recently repowered his Sunrunner 37 with twin Hyundai SeasAll S250's. The vessel was previously powered by twin 5.0L 270hp Volvo V8 petrol engines, all fed via a large 620L fuel tank, something that made McMullen very nervous when he was out on his boat. "It was a large amount of petrol to have on-board, and I was never really at ease holding that much fuel. I've been a boat builder for a number of years, and I now run the boat storage facility here in Sydney harbour, so I've seen what can go wrong with petrol vessels sometimes," says McMullen. 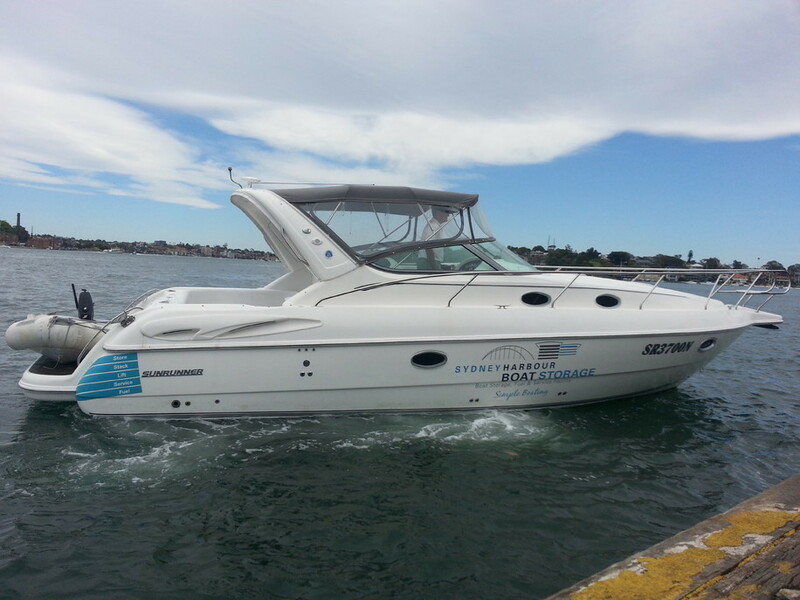 "So when deciding to repower, I had set my mind to converting the boat to run modern and efficient diesels." In replacing his petrol engines with two fuel efficient Hyundai SeasAll engines, McMullen was looking for absolute reliability and no loss of performance. "What I've noticed is that we haven't lost any performance whatsoever which is really fantastic, considering the new engines have slightly less horsepower than the petrol V8's did. But for a diesel they are a high reving engine and they have quite a broad torque curve which has made the boat so much better overall. They don't really behave like an old smelly diesel, and I'm impressed that there is no lag with the turbo chargers." The boat can now achieve 34 knots at 48ltrs per hour per engine – the vessel weighs 7 ton.At a cruise of 19.8knots @ 3,000rpm, it burns 21.2ltrs per hour, per engine, giving the vessel a cruise range of 289 nautical miles. "It's all so much quieter now, and overall I'm pretty happy with how it's transformed the boat's performance, it's very smooth and a lot cheaper to run." 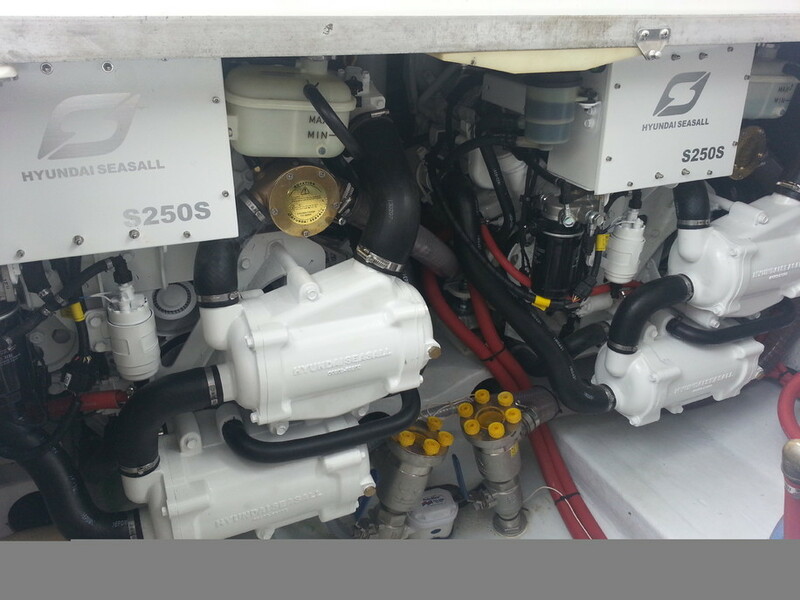 On removing the two petrol engines, McMullen also removed the petrol genset from the boat too and changed over to a new diesel model to ensure absolutely no petrol is used on the boat at all. In making the choice of installing the twin Hyundai SeasAll S250's into his craft, McMullen also elected to keep his existing stern legs, this was not only easier, but more cost effective too. "We elected to keep the current Volvo stern legs, as there was nothing wrong with their condition, and the Hyundai SeasAll engine's adapted to them very easily. 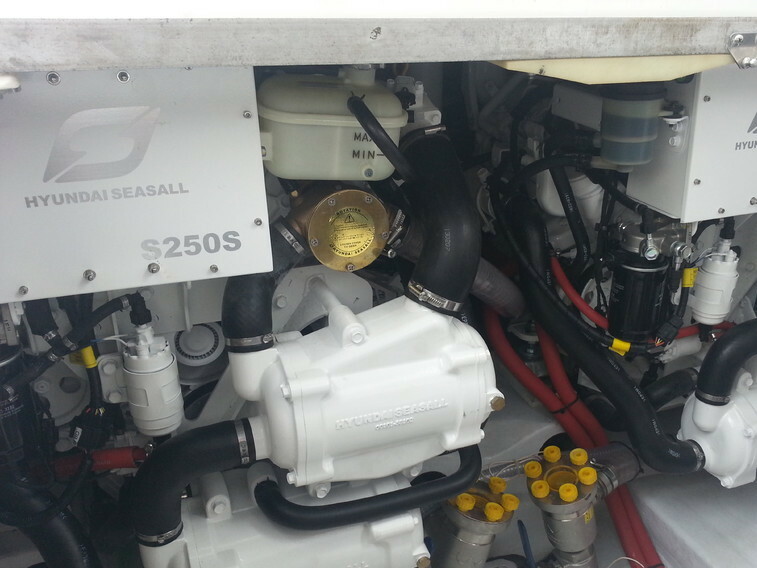 Overall, the two engines were priced very well, especially considering all of the technology they include which made them a very attractive option to consider; especially since the engines themselves include a 4 year Hyundai SeasAll factory warranty"
Australian, Allpower Marine Business Development Manager Brett Sharp says a Hyundai SeasAll diesel engine provide a very cost effective option for those wishing to repower and 'modernise' their vessel. "Essentially, they are an exceptional value packed engine for users who are looking for not only performance, reliability and economy and provide it in a very cost effective package," says Sharp. "We have a large dealer network throughout New Zealand, Australia and the Pacific enabling users to have ready access to parts and service no matter where they are. What's more, we are able to offer competitive pricing and an attractive warranty term for both recreational and commercial users."